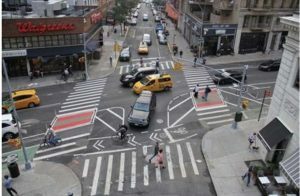 Last Month, New York City DOT gave MCB4′s Transportation Committee a comprehensive update on the roll out of a newly configured 11th Avenue, with a one-way section from 40th Street to 57th Street and two-way below 40th Street. This project is part of the DOT’ Study of Hell’s Kitchen started in 2007 at CHEKPEDS’ request to better utilize roadway capacity in this area. Its implementation has been delayed multiple times but DOT swears that work will start in May 2019! We keep our fingers crossed. 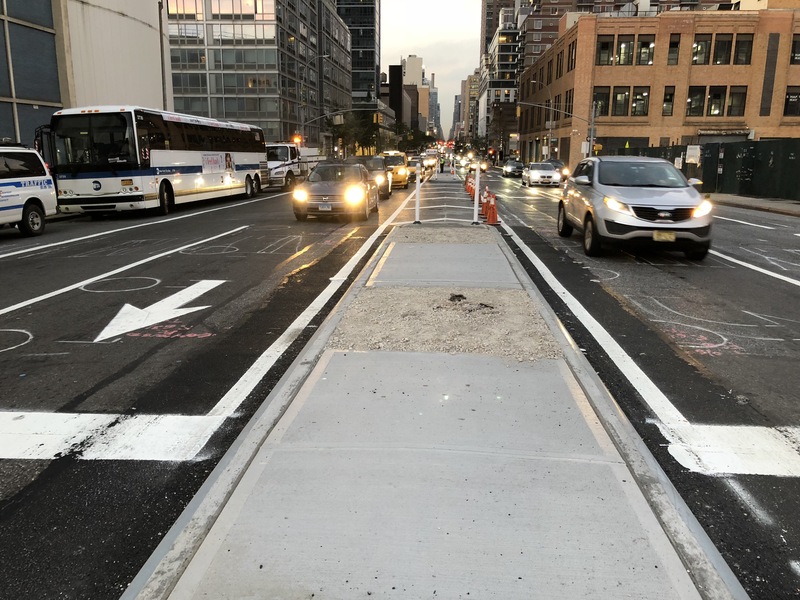 Already last year a section of 11th Avenue between 39th and 42nd Street was redesigned with cement planted medians , which separates tunnel traffic form locations traffic and protects the lives of local residents and NYPD traffic agents. Trees will be planted this season. 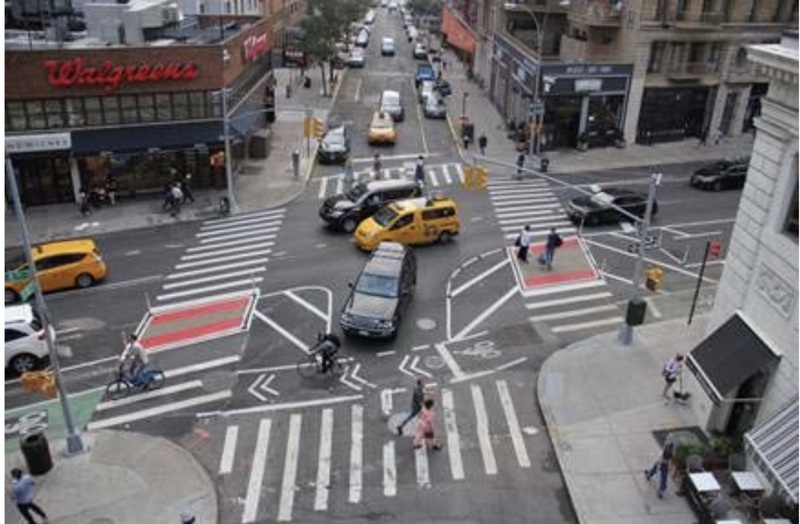 In addition to a true “complete street”, with both a protected bike lane and a bus lane, DOT will be installing a new design to protect intersections at left turns along the bike lane, by replacing mixing zones with “offset crossings”. Such design features a tight corner radius to slow vehicle turns and a short conflict zone between bicyclists and turning vehicles. We have long advocated for this level of protection which benefits equally bicyclists and pedestrians and even participated in the study that DOT completed in 2018. We are delighted to see the first large scale implementation taking place in our district. Bravo to Transportation Alternatives for championing this cause and to DOT for listening. This entry was posted in CHEKPEDS, Complete Streets, DOT STUDY and tagged bicycles, buses, safety, Street Design. Bookmark the permalink.